April 10 is the 100th day of the year(101st in leap years) in the Gregorian calendar.There are 265 days remaining until the end of the year. 1939 – Alcoholics Anonymous , A.A.'s "Big Book" is first published. Year 428 (CDXXVIII) was a leap year starting on Sunday of the Julian calendar. At the time, it was known as the Year of the Consulship of Felix and Taurus. The denomination 428 for this year has been used since the early medieval period, when the Anno Domini calendar era became the prevalent method in Europe for naming years. 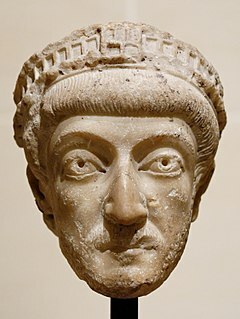 Nestorius was Archbishop of Constantinople from 10 April 428 to August 431, when Emperor Theodosius II confirmed his condemnation by the Council of Ephesus on 22 June. Ryszard Kaczorowski, GCMG was a Polish statesman. Between 1989-90, he served as the last President of Poland in exile. He succeeded Kazimierz Sabbat, and resigned his post following Poland's regaining independence from the Soviet sphere of influence and the election of Lech Wałęsa as the first democratically elected President of Poland since before the Second World War. He also passed the presidential insignia to Wałęsa, thus ending the 45-year long episode of the Polish government in exile. Maria Helena Kaczyńska was the First Lady of Poland from 2005 to 2010 as the wife of President Lech Kaczyński. First Lady of the Republic of Poland is an informal designation customarily applied to the wife of the President of the Republic of Poland. The first lady does not hold a constitutional position and there are no political duties associated with the role. However, the first lady sometimes accompanies her husband on formal occasions such as state visits. Fulbert of Chartres was the Bishop of Chartres from 1006 to 1028 and a teacher at the Cathedral school there. Fulbert was a pupil of Gerbert of Aurillac, someone who would later become pope. He was responsible for the advancement of the Nativity of the Virgin's feast day on September 8 and for one of the many reconstructions of the Chartres Cathedral. Most of the available information about him is found in the letters he wrote from 1004–1028 to both secular and religious figures of the day. James, Azadanus and Abdicius are martyrs of the Christian Church. James was a priest and Azadanus and Abdicius deacons. They were beheaded by Shapur II in Persia in 380. They are collectively commemorated with a feast day on April 10. Mikael Agricola was a Lutheran clergyman who became the de facto founder of literary Finnish and a prominent proponent of the Protestant Reformation in Sweden, including Finland, which was a Swedish territory at the time. He is often called the "father of literary Finnish". Wikimedia Commons has media related to April 10 .